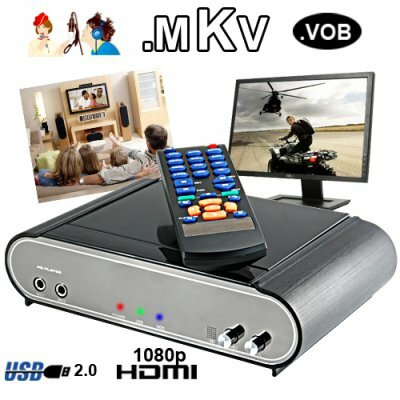 Successfully Added Premium Hi-Def 1080P SATA HDD Media Player (HDMI, KTV, More!) to your Shopping Cart. Presenting a superb home entertainment unit with a high definition video output of 1080P, playback of multiple video and audio file types including MKV, and two professional grade 6.3mm microphone inputs for home karaoke entertainment. This Premium High Def 1080P HDD Media Player is the ultimate solution for today's in-home digital media file viewing. This elegant hard drive media player is beautifully designed to make it easy to use as well as merge with any modern decor. Extremely simple to install, with a few simple steps you'll be able to start watching high definition movies or sing your favorite songs on your big screen TV in the comfort of your very own living room. Insert a 3.5 inch SATA HDD up to 1TB in size, or a 2.5 inch SATA HDD up to 500GB in size. Connect the Media Player to your computer and format the HDD you placed inside the Media Player. Now transfer your digital media files to the Media Player. The unit is compatible with 16 file types. Disconnect the media player from your computer and connect the media player to your TV with an HDMI or YPbPr cable. Turn on the Media Player and you are ready to enjoy the show! The powerful video and audio output on this HD media player ensures you get the best out of today's modern digital entertainment. If you are searching for one single location to store those hundreds of GB's of media files for easier accessibility, then look no further, you have just found the perfect Media Enclosure. There is no more need to keep all those files stored on your computers hard drive. Lets take a look at this list of video files this unit plays; DIVX, AVI, MPEG, RMVB, VOB, XVID, MOV, Real Media, MKV. That covers every movie file type you can download from the internet or rip from DVD. If you want a TV connected media player to enjoy your digital video collection on, now you have found the only HD media player you will ever need to enhance your home entertainment experience. This high-def HDD media player comes with one more special feature that many families can appreciate, this unit also works as a Karaoke unit. The CVHQ-E52 comes with two professional MIC inputs located at the front of the unit. Sing solo or duet, which ever you prefer, this HD media player will ensure your entertainment needs in today's exciting digital world keeps getting better. So if your in the market for a media player that will provide you with endless entertainment pleasure and add value to your digital life, then we welcome you to try the E52 Premium Hi-Def 1080P SATA HDD Media Player. This latest edition to our HDD Media Enclosure family is in stock now and available to you at an awesome factory direct wholesale price. Why wait, order yours today! Make sure the lrc subtitle file is in sync with the music file and that they are saved in the same folder, under the same name. Will this media player work in North America? Yes, This is HI definition media player will work world wide. Does this media player plays MKV file formats? Yes its does, it also plays VOB and other popular video formats . What does the cross mic talk actually mean? This is a great technical function that allows the audio output to be crystal clear, when two individuals are singing at the same time, through either a single microphone or two separate microphones.